One of many bogus UFO photos from "Adrian." 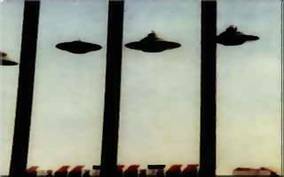 This photo was analyzed and revealed strings suspending the UFOs, in spite of "Adrian" promoter Sean David Morton claiming that the photos were analyzed by special effects experts that could find nothing wrong. Phony Florida UFO contactee "Adrian" took lots of Billy Meier rip-off photos/videos and claims same type of aliens that contacted Meier are contacting him. (That's not going to go over too well with Meiers as he claims an exclusive on HIS aliens.) Refuses to have evidence independently evaluated. Case discovered by Randolph Winters. Sean David Morton began promoting this case when he told Adrian that he "could make a lot of money" from his case. Winters is, in the words of Morton, "Out of the picture." Morton changed "Adrian's" name to "Akron" and had him on a speaking tour of Europe. Word is the tour did not do so well and the Euros aren't flying into Morton's wallet. Not everyone is as gullible as Morton thinks. Morton has been alleging for years that he has a video showing Adrian walking into a space craft...sure he does... SEE: Assembly Required where you can see the strings from the above photo supporting Adrian's bunk UFOs.